Sunday morning, Jan and I bade farewell to Middle Village and drove with Peter back to Morningside Heights. 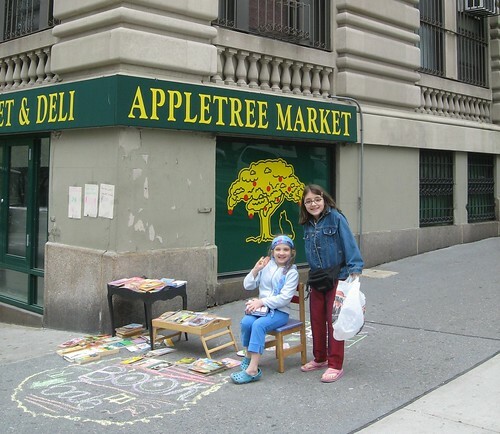 He found a parking space near our former apartment at 423 W. 120 St. in front of which sat two little girls selling some of their old books–a nice selection of Berenstain’s Bears to bring home for the grandchildren. We passed huge construction cranes filling the airspace at the corner of Broadway and on to Earl Hall, the venue for the morning’s programs. Entering the upstairs rotunda we heard the last part of an extraordinary soprano saxophone rendition of “Amazing Grace” closing the memorial celebration for those of the strikers who had died in the last 40 years. Jan was still sorting documents upstairs, and there was nothing for me to do till decisions were made about how to dispose of the furnishings. 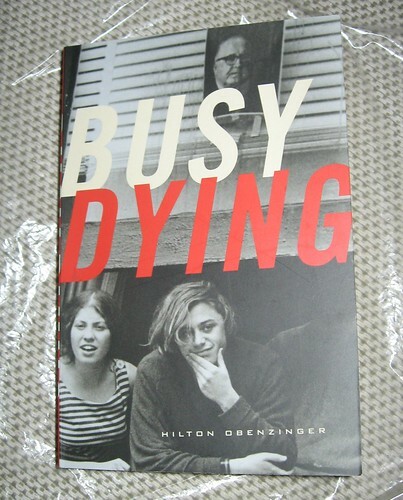 I sat on one of the plastic covered sofas and started reading my signed copy of Busy Dying, Hilton Obenzinger’s delicious new memoir centered on Columbia 68, while Peter conferred with the real estate agent in the dining room. Early Friday morning Jan selected clothes for Peter to take to his mother in the nursing home, and I divided the basement into areas for stuff going to the trash, to Goodwill and possibly to keep. 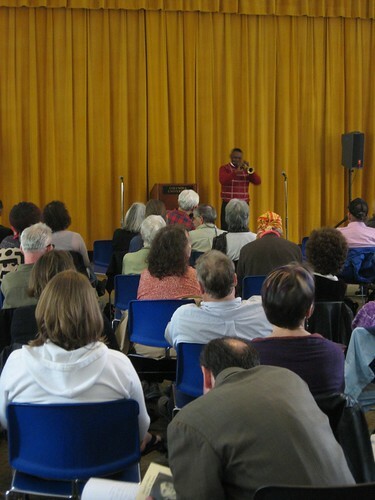 On the subway trip back to Columbia, we attracted many people eager to direct us. Passing the gates at College Walk, we heard loud noise coming from Low Plaza and noticed hundreds of pink balloons attached to posts and railings all over the central quad. Wow! 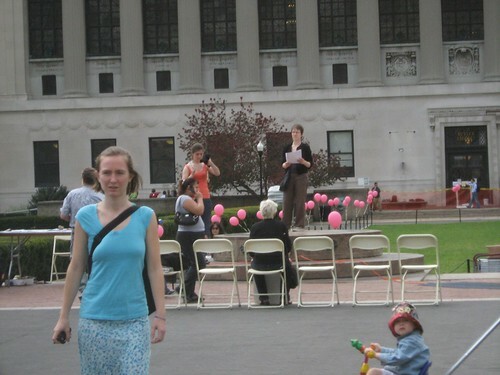 I thought, there must be a huge group of Code Pink students marking the fifth anniversary of the Iraq war today. But instead it turned out to be a festival sponsored by a Korean-American sorority. We arrived a few minutes early at the Journalism building for the morning session and met up with Taigen Dan Leighton, Zen priest, translator and scholar, just arriving from a stay in Richmond Virginia where he led members of the Buddhist Peace Fellowship in a walk along the Slave Trail and a meditation vigil at the Statue of Reconciliation in downtown Richmond, Virginia, the site of the slave auction houses. Ten days after it ended, I’m still processing the conference and slowly going through my notes trying to sift out memories and lessons to keep. So much of significance was happening at every moment that weekend–the recreation of past occurrences forgotten or newly understood, the simultaneous evocation of forty years of experience in hundreds of exceptionally conscious minds, the unfolding of present day history in encounters with young people and emergent political disputes, plus the emotional impact of connecting with old friends–it could generate a different book by every one of the participants. I look forward to see what comes of the many films, sound recordings and pictures documenting the activities while they were happening. This picture was taken on the front steps of Peter Behr’s family home in Middle Village Queens, where we stayed for four nights during the conference. 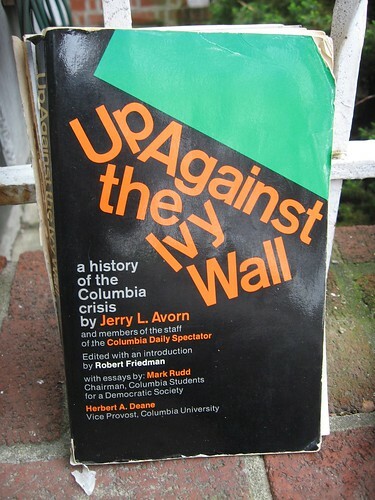 I had spent the whole ten hours of our flight engrossed in the story of the strike narrated in the 300 page book, Up Against the Ivy Wall, written immediately after it concluded over the summer of 1968 by the student reporters of the Columbia Spectator. I hadn’t looked at the book since the year it was published, and clumps of its pages came apart as I read. I was astounded by the precision of its research, the astuteness of its political analysis—even with the distance of hindsight–and the liveliness of the narration. As I finished with each clump of pages I passed it to Jan who was equally enthralled. The book was edited by Robert Friedman, Spectator’s editor at the time and now one of the organizers of the conference and moderator at many of the sessions.